Start the new year off right with a crafty project: a pine cone zinnia wreath! This wreath has rustic charm, and there’s nothing like natural décor to bring the beauty of the outdoors in. 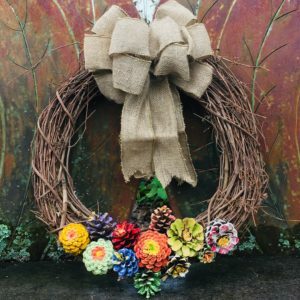 Instructor Rebecca Turk will guide you step-by-step in making an 18-inch pine cone zinnia wreath, and each attendee will go home with their creation. Join us on Thursday, January 24, 2019 from 10AM-2PM for this crafty class. The cost is $25 per person. Wear clothes you can paint in. Lunch is included. If you have any special dietary needs, please contact Rebecca Turk at rturk@moorefarmsbg.org.